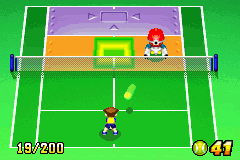 Tennis Machine is a minigame in Mario Tennis: Power Tour for the Game Boy Advance. Unlike the other minigames (with the exception of Wall Practice), Tennis Machine is not beneficial to Clay or Ace's Power Shot. Instead, it helps their skill in other categories, such as volleying, topspin, and serving. The objective is to set a new record for that certain level. The player must hit the tennis ball shot from the tennis machine into a certain spot on the court. Gray areas earn the player zero points, orange areas earn the player one point, and flashing green and yellow areas earn the player five points. The locations of the areas change with every hit of the ball. In each level, the machine shoots a certain amount of tennis balls depending on the difficulty. The machine shoots ten balls on the Beginner difficulty, twenty balls on the Standard difficulty, thirty balls on the Expert difficulty, and forty balls on the Master difficulty. There is also something called a Perfect Score, which is the maximum amount of points the player can earn for a level. Players need 20 points to pass Beginner, 50 to pass Standard, 100 to pass Expert, and 200 to pass Master. The shots also get more demanding with each level. Novice players can generally clear Beginner and Standard easily, with Expert being a little more demanding, and Master a huge difficulty spike. Completing the Master level will result in Alex and Nina walking onto the court to congratulate the player. Their dialogue will be different, depending on whether or not the player has won the Island Open or not. Beginner: Try for a perfect score while hitting the tennis machine's balls into the designated area. A perfect score is 50 points. Standard: Try for a perfect score while hitting the tennis machine's balls into the designated area. A perfect score is 100 points. Expert: Try for a perfect score while hitting the tennis machine's balls into the designated area. A perfect score is 150 points. Master: Try for a perfect score while hitting the tennis machine's balls into the designated area. A perfect score is 250 points. This page was last edited on April 19, 2019, at 06:48.